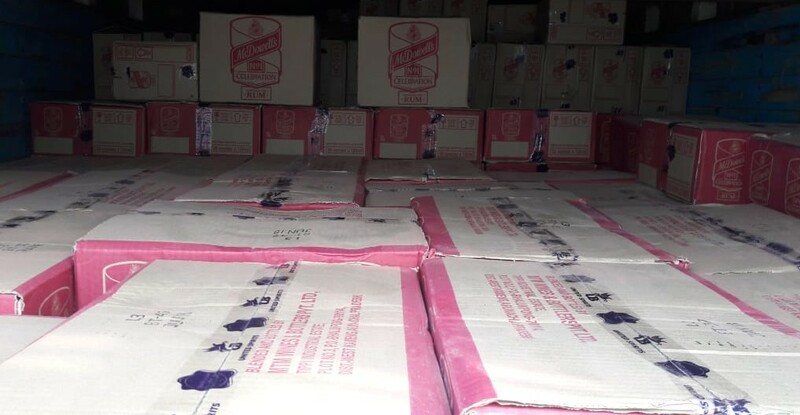 Despite the State Government’s ban on the sale and consumption of IMFL brought from other states, a truckload of illegal liquor was seized along Assam-Nagaland interstate border in East Karbi Anglong district on Tuesday. The development came after the Khatkhati police seized a truck bearing registration number RJ 07GD 0067 from a parking lot in Bokajan area along Assam-Nagaland border. The truck was loaded with over 560 cases of IMFL and was meant for sale in Arunachal Pradesh. The approximate face value of the seized consignment is said to be around Rs 10 lakh. Earlier in July 2017, the excise department sleuths seized a truckload of the illegally transported liquor after the department detected a severe drop in the sale of IMFL in the wine shops bordering Nagaland. Another truckload of illegal IMFL was seized by the Excise department officials based on specific information in December last year. The development hints a possible interstate racket active in smuggling liquor into the dry state of Nagaland. However, the Excise department in collaboration with the Kabri Anglong police has been doing a commendable job in checking pilferage of illegally imported liquor to tap revenue loss in the current fiscal. The BIEO sleuths had raided as many as five specific locations in the area and made a seizure of over 70,000 cases of Arunachal sale IMFL stored illegally for sale in the dry state of Nagaland and Manipur in December 2016.